Toyota Motor Corp. became the world's top seller of automobiles in the January-March quarter, topping General Motors Corp. of the United States, according to sales data released on April 23 by the Japanese automaker. Japan's top automaker said its global automobile sales in the period totaled about 2,348,000 units, compared with GM's global sales of about 2,260,000 units. It is the first time that Toyota has become the world's top seller on a quarterly basis, while the automaker is widely expected to be the world's top auto seller in 2007 as well, with its global sales projection at around 9.34 million units. GM has not released an annual sales projection for the current year, but it sold 9,098,000 units globally in 2006. With higher crude oil prices pushing up gasoline prices, Toyota enjoyed brisk sales overseas of its fuel-efficient small vehicles such as the Corolla in the United States and the Yaris in Europe. Sales in the United States marked a year-on-year increase of about 11 percent, while sales in Europe were up about 19 percent in the quarter. 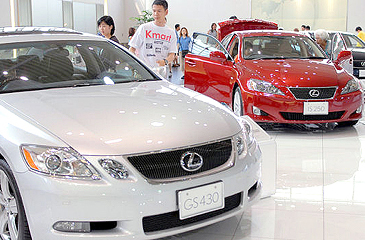 In addition, midsize vehicles such as the Camry sold strongly in China, resulting in an 18 percent increase in the whole Asian region. In fiscal 2006 ended March, Toyota's global production and sales reached all-time highs, with 9,077,000 units produced, up 7.3 percent, and sales of 9,006,000 units, up 9.1 percent.